Background. The introduction of Open Source Software technologies in the Public Administration plays a key role in the spread of Open Source Software. The state of the art in the adoption of Open Source Software solutions in the Public Administration is not very well known even in areas like Lombardy, which is Italy’s largest and most developed region. Goal. 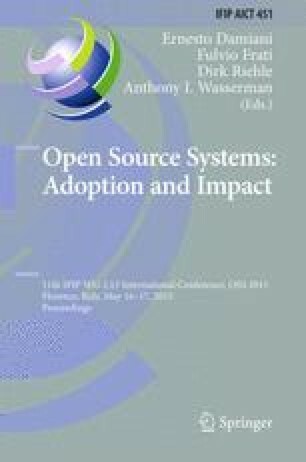 The goal of the investigation documented in this paper is to obtain a clear picture about the introduction of Open Source Software technologies in the Public Administration, the obstacles to their adoption, and the willingness of stakeholders to proceed with their introduction. Method. We carried out a qualitative and quantitative survey that was submitted to a representative part of the Public Administrations in Lombardy. Results. The analysis of the qualitative and quantitative information shows that several Public Administrations are already using Open Source Software technologies, though not in all application areas. The savings are one frequently cited incentive to the adoption of Open Source Software. However, one obstacle is the fact that a comprehensive law on software in the Public Administration has not yet been approved. Conclusions. Our analysis provides results that indicate a common understanding of incentives, obstacles, and opportunities for Open Source Software technologies in Public Administrations.